These saws have an up and down action similar to a jig saw. They have a lot larger cut depth than a jig saw, ranging from 30mm to say 80mm. They come with a range of cutting blades for timber, plastics and metal. My old Makita Recipro Saw. The small blue blade is a standard jigsaw blade by way of a size comparison. These saws have an up and down action (reciprocal) similar to a jig saw. They have a lot larger cut depth than a jig saw, ranging from 30mm to say 70mm. They come with a range of cutting blades for timber, plastics and metal. In my opinion they are a bit clumsy for cutting curves but they will do a faster job than a jig saw when doing longer curves for form work and the like. Where they do excel is in renovation work, cutting through timbers in spots that can not be reached with other tools. With metal blades they are very useful for cutting through seized or rusted bolts. 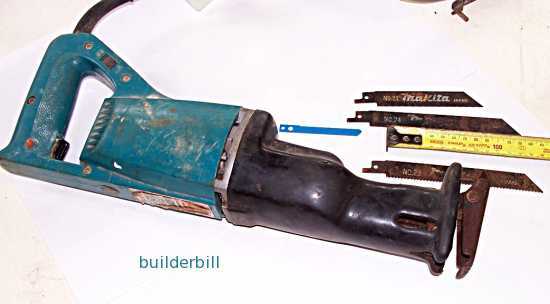 Below is a cordless reciprocal saw that is one of my plumbing mates' essential tools. For guys like him that are into maintenance work and doing call-outs the speed of use of the new cordless tools with no setting up of power leads and safety boxes is must have.